Creamy, cheesy and covered in toasted almonds, this Hot Crabmeat Appetizer knows how to get a party started! Preheat oven to 375°F. Mix all ingredients except almonds until well blended. 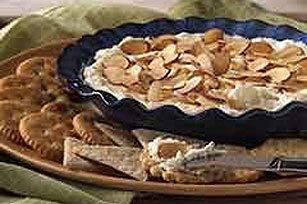 Spoon mixture into 9-inch pie plate; sprinkle with almonds. Bake 15 min. Serve with assorted crackers. Can't decide what to eat at a social occasion? Try previewing your choices and decide which you’d like to try instead of taking some of each. Microwave cream cheese in medium microwaveable bowl on MEDIUM (50%) 30 sec. Add all remaining ingredients except almonds; mix well. Spoon into 9-inch microwaveable pie plate. Microwave 8 to 9 min. or until heated through, stirring every 3 min. Prepare as directed, using one of the following flavor options: Hot Ham Appetizer: Substitute 1 cup finely chopped OSCAR MAYER Ham for the crabmeat and increasing the horseradish to 1 tsp. Hot Clam Appetizer: Substitute 1 can (8 oz.) minced clams, drained, for the crabmeat. For more intense flavor: Increase onions to 1/4 cup, milk to 1/4 cup and horseradish to 1 tsp.